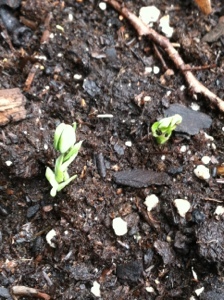 Sugar pod peas poking out to say hello to the world! Photo by Grey Catsidhe, 2015. 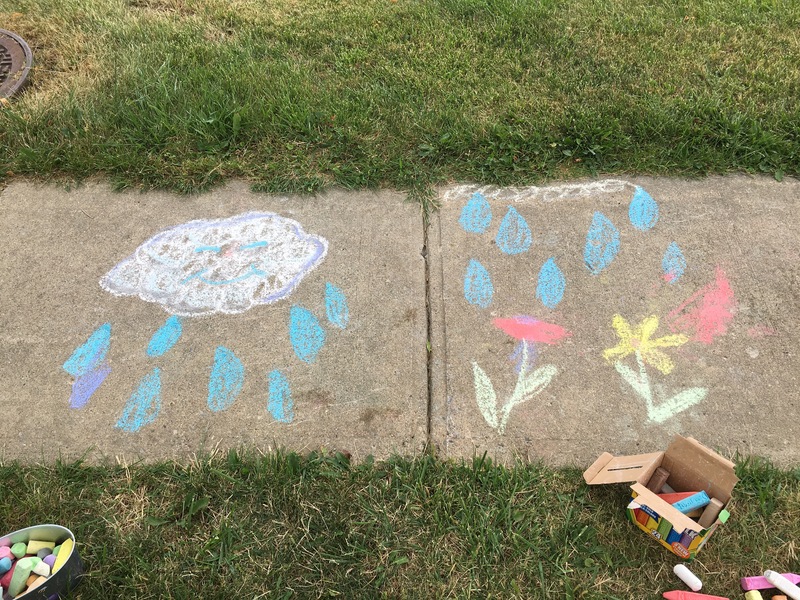 My daughter and I took a walk around our home to celebrate Earth Day. Granted, we do this regularly, but why not do something outside today? It was chilly, so, regardless of what season the calendar says it is, we took our winter coats out. First, we visited the container garden in back to inspect the newly planted onion set and the bed of dwarf sugar pod peas. As you can see from the photo, the peas are germinating! I’m hoping that their reputation for cold hardiness gets them through the low temperatures this week. I may need to tuck them in for a few days each night! Sticking close to the hedge, Bee and I wandered a little further from home to look for signs of spring despite the chill. Right off the bat, we heard a chorus of frogs in the marsh behind our home. Each day we go out, I tell Bee that the sound comes from frogs, and she knows what they are due to lots of reading and animal-oriented shows. She got down on all fours and proceeded to bounce, chanting “hop, hop, hop!” That had to stop when we reached muddier terrain. “Squish, squish, squish!” I said, picking her up. Her boots aren’t as waterproof as mine. Mud boots are on Bee’s birthday wish list! I pointed to the white oak, but the buds weren’t as obvious on him. The maples had glorious, red buds that were bursting open. Bee liked looking at them more. I was able to hold her up so she could carefully touch them. “Gentle, gentle,” I cooed. She knows that word from interacting with our cats and my lemon tree. “Twee. Twee,” she said. We reached a green hill, lovely and green after the rain we received, and Bee gleefully ran up with me. She loves open spaces to race and explore. We didn’t linger there long because the cold wind whipped our faces. Bee held her hat as we gingerly climbed down. We decided to go home. Chilly wind equals snotty noses, and Bee needed a handkerchief. Silly mama! Why didn’t I pack one? They’re necessary when out and about. Between work and toddler care, I wasn’t able to do anything traditionally associated with Earth Day. I didn’t attend a rally, pick up litter, or plant trees. If my husband had been home, it would have been easier to manage a bag of litter (one parent handles the bag and the other watches the tot), but it’s hard when you’re on your own. Earth Day was simple for me this year: a walk around our little patch of home, observing the natural changes. We made offerings of birdseed to the local spirits and Earth Mother. I said a prayer of thanks and Bee babbled, obviously trying to join in. She solemnly blew a kiss to the trees when we were done. Engaging in such activities today and every day will help raise a child who places value in the Earth, a child who is more likely to be intrinsically motivated to attend rallies, plant trees, and pick up litter when she’s older. I’m laying the foundation. Even if she decides that Druidism (or Paganism in general) is not the path for her, I will consider myself successful if she grows up to love and honor the Earth, and every being she shares her home with. 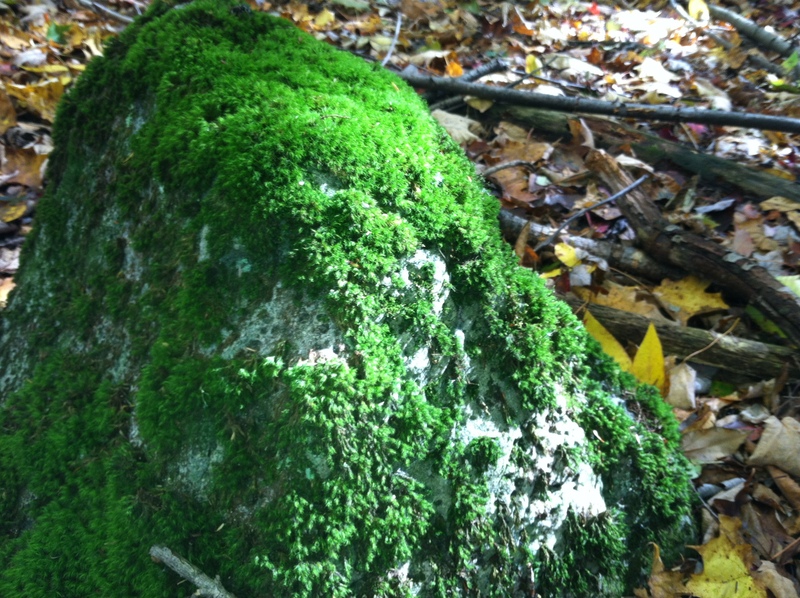 A lovely, moss-covered rock I encountered on my walk today. Photo by Grey Catsidhe, 2014. Today I went to the forest to do a devotional. It’s a perfect day for that. The sky is clear, allowing the sun to hit the changing leaves. It makes them look like a brilliant flame! As a precaution against hunters and bears, I donned a red jacket and, once I was in the forest, sang “We Approach the Sacred Grove” on my way to my little nemeton. When I got there, I circled clockwise, stopping before the oak tree. I then allowed myself to breathe and take in the beauty of my surroundings. I felt so at peace and thankful to be there. It’s something I look forward to each week. If I miss my walks for some reason, I do my devotionals inside, but there’s something extra special about doing them in the forest. Inspiring me to speak with truth, beauty, and eloquence. And that you open the ways. Lady Brighid – let the ways be open! It is a work in progress. I feel that I tweak that process and prayer a little each time, but I like how it is working out. I attuned with the fire, well, and tree, meditating on their symbolism and power. This is always very visceral for me when I’m outside. I focus on how I sense them. The sun’s warmth and light touches my face, the creek nearby often gurgles, or the sun glints off the raindrops on the leaves. The oak tree, which I lean on when I focus on the Two Powers, gives me strength and stability. The firm earth gives me a foundation on which to stand. I sang to the Earth Mother, then bent to give her a kiss. Next, I prayed and gave offerings to the Three Kindreds, followed by special offerings for my spirit guide and patroness. When I am in the woods, I meditate, but not the way I do inside. Being out in a forest, off a path, I need to be mindful of the possible dangers. I relax but generally don’t close my eyes. I stand against the oak tree and soften my gaze. I let myself truly open up to the sensations of the forest. My purpose in going to the forest is to commune with the land, with the Nature Spirits there, and praise the Kindred among the trees. I’m not trying to escape that in some way by visualizing an alternate grove. When I meditate in the forest, it is to fully immerse myself in that environment. When I leave, I carry that with me for all the times I pray and meditate inside. Going into the woods is like recharging a battery.